This month, the Knights of the Vine took a trip to New Zealand courtesy of HSBC when the bank sponsored a huge wine event at the top of the Swissôtel. New Zealand wines, though fairly recent on Moscow wine lists, have become popular in the city, so by the time of the event the guest list had swollen to close to four hundred. The event started at 7pm, but when I arrived at 6:40, a crowd was already forming. The Swissôtel wait staff began to pour the first wine, Saint Clair Marlborough Sauvignon Blanc 2007, shortly after seven. 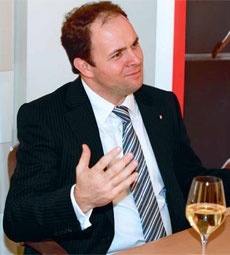 HSBC brought in Vladimir Capelik, well-known Moscow wine expert and President of the Independent Wine Club, to narrate and discuss each wine as it was served. There were a number of guests of honor, led by New Zealand Ambassador Ian Hill and his wife, and two New Zealand wine importers, Fort and Trinity, set out tables to pour some of their other selections. The format was stand-up with a buffet of starters and desserts. During the past few years since Moscow’s first significant import of New Zealand wines, winery representation has steadily grown to about twentyfive, mainly the better known labels. For the most part, New Zealand wine prices push past 1,000 roubles (and even well past), though there are a few wines – from Sileni, Nobilo, Villa Maria, Montana – that can be had closer to 500 roubles. Nobilo, owned by wine giant Constellation, has a bargain brand, Orca Bay, which hits the lowest price point for New Zealand wines in Moscow. Sauvignon Blanc first drew international attention to New Zealand wines; the region’s terroir produces grapes that provide these white wines with vibrant and intense fruitiness, which put them among my personal favourites a number of years ago. New Zealand Chardonnay also does well, and local winemakers generally do not favour the heavy oak that this grape receives in other areas, particularly California. For reds, New Zealand excels at Pinot Noir, a very finicky grape that thrives in few places, but this country is one of them. 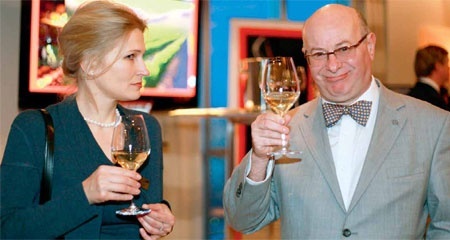 Surprisingly, Cloudy Bay Vineyards Sauvignon Blanc, now a cult classic, is not yet imported to Russia. 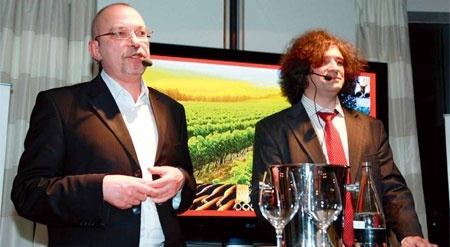 As I understood from Johan Sekora, Head of PFS Russia for HSBC and organizer of the event, a considerable amount of pre-planning went into the final selection of the six wines that were on offer for the evening. There were a number of pre-tastings to pare the selection down. I particularly enjoyed the Saint Clair Marlborough Sauvignon Blanc, an absolutely wonderful and fruity wine and great example of the potential for the grape. The Villa Maria Sauvignon Blanc, apparently available at Metro for under 500 roubles, gets the nod for best quality/ price rating. The evening ended with a lottery with a top prize of a trip for two to New Zealand. But I did win a handsome Russian language coffee table book about New Zealand wines authored by Mark Kauffman, Moscow’s first major importer of wines from that country. We look forward to the next HSBC wine gathering.